In this modern, trendy space you’ll find it hard to choose from all kinds of vegan delights; falafel, Buddha bowls, pasta, salads, soups, sweet potato fries… Visitors can’t get enough of their signature burgers with avocado or mushroom in place of a bun. The chefs prepare everything on-site with super-fresh local ingredients. If you’ve a sweet tooth, you can try their famous vegan cheesecake as well as lots of chocolatey delights and fruit desserts. The chefs are always adding new items to their menu so it’s worth calling ahead to ask about their specials. Mme Berton has a passion for patisserie and you can see the amount of care and attention that goes into making each treat. The people of Nice love their desserts so much that in 2017 the Bertons opened Amour Patisserie Végétale (Link to Amour Blog Post), the first vegan patisserie in Nice, and business has been booming ever since. Book ahead, if there’s a group of you as this place is always filled to the brim with friendly locals. Eating is can be sat on one of the quirky palette chairs, or at one of the larger communal tables. 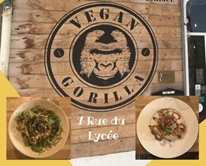 Vegan Gorilla is also perfect for a takeaway lunch; grab one of their freshly pressed juices and a snack that takes your fancy and head over to Promenade du Paillon for an Al Fresco lunch. This way you can bask in sunny Nice and enjoy guilt-free tasty vegan treats.